Tonight marks yet another installment of this year’s Live on the Green concert series down at Public Square Park, which you may recognize as Nashville’s premier destination for free live music each Thursday. This is the third of four weeks (though next week is a three day long music festival) and features some pretty fantastic talent, including indie pop breakout act Capital Cities, local rock veterans The Features, and local psychedelic four piece All Them Witches. The whole affair begins at 6:15 pm with All Them Witches, but doors open as early as 5 pm. The event is all ages and, as previously mentioned, free, though if you want the VIP experience, you’ll need to shell out $60. Also, keep in mind that this is a massively popular event and parking is always tight; spots are available in the parking deck beneath the Public Square Park for $3, or you can try to find free metered parking after 6 pm. See you there! Being the musically educated and up-to-date readers we know all of you are, chances are you’re probably already familiar with LA based indie pop duo Capital Cities (they tend to play with a backing band, however). Besides reaching number eight on the Billboard Charts, the group’s hit single, “Safe and Sound,” has been featured in at least 12 different commercials in the last six months. Of course, there’s a reason Capital Cities have experienced this level of publicity recently: their upbeat pop tunes are undeniably catchy, and the pair manage to put on a fantastic live show. We actually got a chance to see them open for Fitz and the Tantrums awhile back, and catch them at both this year’s Bonnaroo and last, so we can vouch firsthand for their performance chops and ability to work an audience. Perhaps most entertaining is the group’s affinity for line dances; they’ve come up with simple dance moves for almost all their songs that are quite easy for the audience to follow along with. Basically, these guys are the full package: great live show, well-written tunes, engaging stage presence. The Features are veterans of the Nashville rock scene; they’ve been playing gigs here and in Murfreesboro since back in the mid-’90s. The group helped pioneer the indie/garage rock movement, and really seem to be artists that pursue music simply for the joy of the medium. This is evident both in the fact that The Features have recorded a number of albums that they never released, and also in their tendency to tour ridiculously each year. Recently, the group have become involved with Kings of Leon-run label Serpents and Snakes, which should only further add to their credibility and allow the group to continue doing what they do best: pen rocking tunes. We can guarantee that their show tonight is a ton of fun; in fact, we’re so sure it’s going to be a blast that if you disagree, we’ll refund the entirety of the price of your general admission ticket right out of No Country’s own pocket. How’s that for a deal? Coming to us from right here in Music City is psychedelic quartet All Them Witches. If you’re active in the indie scene around here, chances are you might have seen these guys play, but, as of late, they’ve been popping up at tons of proper venue shows and festivals. The band are currently gearing up for the release of the project Lightning in the Door, which should be released to the public in late September. While these guys are definitely able to throw down when need be, they’ll also be getting a bit of extra help this evening, as Mickey Raphael of Willie Nelson fame will be playing harmonica. It’s going to be a great way to kick off a fantastic evening, and we definitely recommend coming out early enough to check out All Them Witches. 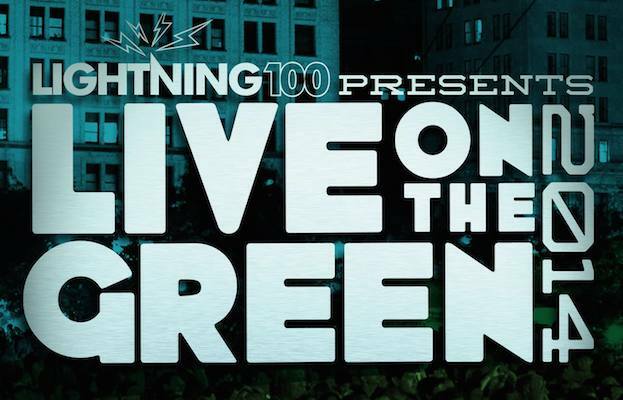 Capital Cities, The Features, and All Them Witches will perform TONIGHT at Live on the Green at Pubic Square Park. The FREE all-ages show begins at 6:15 p.m. (fest site opens at 5 p.m.).